Shannon Rowe and His Team Take Another Win!! 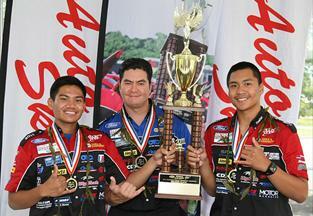 Maui High School students took second place at the 2011 Ford/AAA Student Auto Skills National Finals Tuesday morning. The competition is designed to find the best automotive technology students across the U.S. The student team from Oregon won first place. Maui High’s graduates Jimbo Paranada and Marc Paguirigan took 62 minutes and 42 seconds to repair their deliberately bugged Ford F-150 XLT 4×4 Super Cab at Ford Motor Company world headquarters. The Hawaii student team, and the Oregon student team, submitted “perfect trucks” to judges which contained no repair work demerits. But Oregon’s faster hands-on finish of 58 minutes and six seconds pushed them over the top to win the competition. The Maui students were coached by Maui High Instructor Shannon Rowe, a former Hawaii state champion of the Ford/AAA competition, who also was a second-place finisher at the national finals in 1996. This was his third trip to the national finals as an instructor. The annual competition gives auto tech students the opportunity to showcase their automotive problem-solving capabilities by resolving “real world” vehicle repair challenges in a timed, head-to-head match-up of top teams from 50 states. Kahului-based Maui High teams have represented the state at the national finals for at least 16 years, almost annually since 1992. They’ve placed in the top 10 for 10 years and won national titles in 1995 and 2000. Last year’s team placed ninth. More than 10,000 high school juniors and seniors competed in this year’s competition with $12 million in scholarships offered. The second-place Hawaii team received thousands of dollars in scholarships to pursue their automotive education, along with assorted prizes and trophies. As one of the top-10 finishing schools, Maui High School will receive an engine from Ford for their automotive technology program to use in training. The student pair also will receive a trophy for their school.